Picnics and barbecues are among the pleasures of summer. But leaving food outside in the hot sun or grilling food improperly can leave you sick. The Food and Drug Administration has some advice for keeping food safe during the summer. If you are bringing coolers to your picnic, use ice or frozen cold packs to keep the temperature below 40 degrees Fahrenheit. Consider using one cooler for perishable foods and another for beverages, so that as people open the cooler to get beverages they don’t raise the temperature of the food cooler. If you are bringing raw meat, be sure to keep it separate from everything else. Wrap raw meat securely so that the juices cannot leak out. If you are not going to cook the meat right away, you might be able to pack it into the cooler while it is still frozen. Be sure to wash fruits and vegetables before you pack them, in case there is nowhere to wash them effectively at the picnic site. Also, bring hand sanitizer in case there is no running water at the site. If you marinate food before grilling, always marinate in the refrigerator; never marinate at room temperature. If you cook your food partway before grilling, move the food immediately to the grill when you are done with the partial cooking. Don’t refrigerate and grill later. 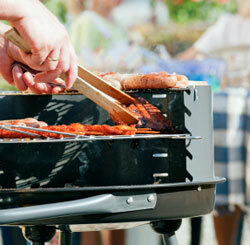 Use a food thermometer to ensure that you have grilled food, especially meat, to an appropriate temperature. Beef, pork and fish should be cooked to at least 145 degrees Fahrenheit, ground meat should be at least 160 degrees, and poultry should be at least 165 degrees. Never put the cooked meat onto the same dish or platter you used for the uncooked meat unless you wash it thoroughly first. Keep cold food in the cooler – which should be no warmer than 40 degrees – until you are ready to serve it. Once you put perishable food out, you should not let it sit for more than two hours if the outside temperature is below 90 degrees. If it is 90 or above, don’t leave food out for more than one hour. Similarly, don’t leave hot food sit out for more than two hours, or one hour if it is above 90 degrees. If food sits out for longer than that, throw it out.